Posted on Tuesday, November 28th, 2017 at 7:21 pm. The family of sour cocktails is some of our favorites and they follow a very simple formula. Margaritas, Whiskey Sours, Daiquiris and Sidecars all have something in common. They are made of a ratio of 1 part sweet: 1 part sour: 2 parts spirit. The sweet and sour parts of the ratio can slide up and down depending on taste and the ingredients you are using, but this general formula is a home bartender’s best friend! 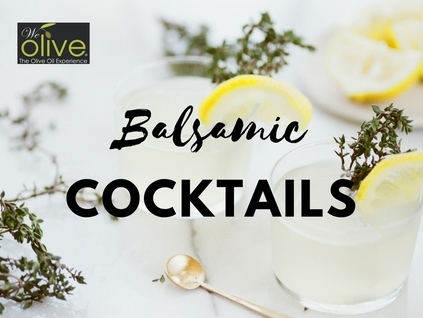 We Olive Balsamic Vinegars, both white and dark, are balanced in sweetness and acidity making them the perfect addition to a classic sour cocktail. Simply use our adapted ratio of 1.5 – 2 parts balsamic vinegar: 2 parts spirits and a modern twist on a classic sour is born. Simply add the desired ratio of balsamic vinegar and the spirit of your choice to a cocktail shaker filled with ice and shake well. Strain into a glass and serve neat or over ice. 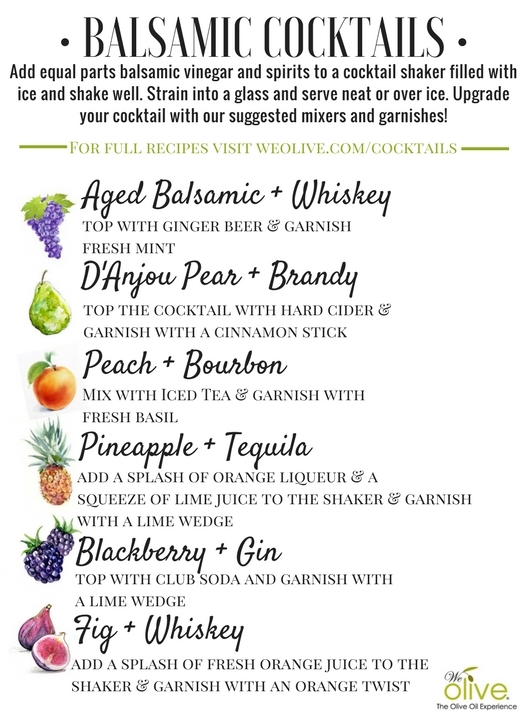 Check out our favorite combinations along with some fun upgrades and garnishes for a modern cocktail party! Download a PDF of the cocktail guide here.